This property is part of a group. Show all properties in Croft Cottages This property is part of a group. A portable ramp for access over steps is available on request. This property is one of our super pet friendly properties and welcomes dogs. Less than a ten minute drive from the holiday resort of Perranporth with its three-mile stretch of golden sands, Little Croft, Croft Cottage, Beech Croft, Hazel Croft and Pine Croft are attractively set in just under four acres of mature gardens, fields and small areas of woodland on the outskirts of the village of Goonhavern. The village has a local shop and post office, pub, and large garden centre with pet, greengrocer, gift shops and cafe, all within a short 10 minute stroll. Perranporth, 2.5 miles away, has a sandy beach popular with families and a number of cafes, restaurants, pubs, a small supermarket and surf hire shop. The cathedral city of Truro and the bustling seaside town of Newquay are approximately a 15 minute drive respectively and this is an ideal location for touring the county. There are riding stables and a golf course also nearby. Whilst each property has its own outside space, the owners encourage visitors to make full use of all the grounds for recreational purposes where there is an enclosed paddock to exercise dogs. Much larger than the name implies, with restful views of tree covered gardens, this fully double glazed, light and airy, very comfortable detached bungalow is entered from the main courtyard, with an adjacent parking area. The accommodation consists of a bright and spacious sitting room with two comfortable leather sofas. A large double glazed window incorporates a door which opens onto a secluded patio, fringed by mature trees and lawns. On the patio there is a brick bbq for the sole use of this cottage. There is a large sunny well equipped fitted kitchen with a dining area to one end. Leading off from the hallway is a bathroom W.C. with hand basin and shower over the bath and two pretty bedrooms, one with a double bed, the other a small children's room with bunk beds measuring 2ft 3in x 5ft 4in. 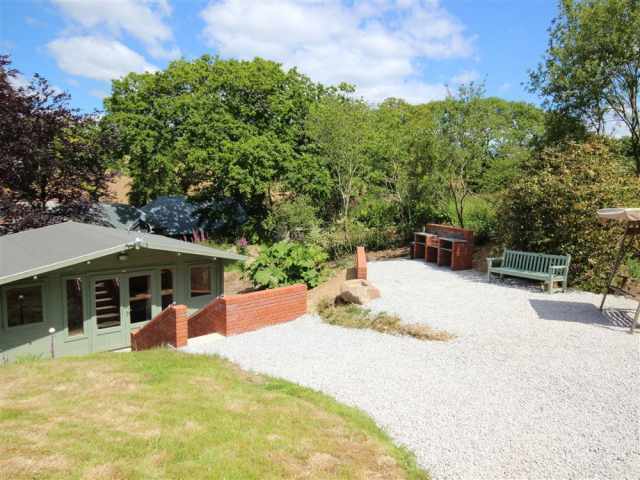 All of the rooms are on the level and have views of the surrounding trees and woodland. There is parking available for one car with further spaces on request. - This property is one of our super pet friendly properties and welcomes dogs.